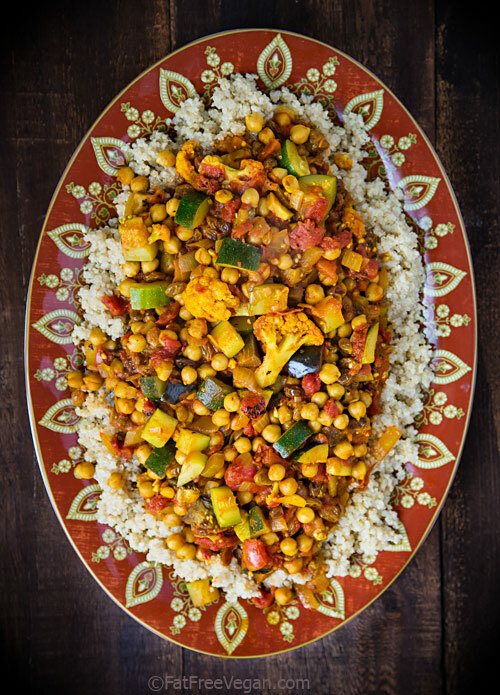 One of my family’s stand-by meals is the Vegetable Couscous from Jeanne Lemlin’s Quick Vegetarian Pleasures. I’ve mentioned before that I have a sentimental attachment to this almost one-pot meal because it was one of the first things that my husband D cooked for me when we were dating. But beyond that, it’s quick, it’s hearty, and it’s full of ingredients I love. So it’s not surprising that I turned to it–with a few changes–when I needed a potluck dish for the second time in one weekend. I’d made my Warm Pasta Salad for a potluck with my book group on Saturday night, so I wanted something different for the Sunday potluck at my church. 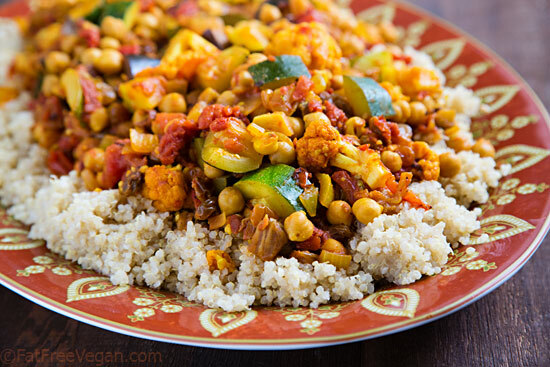 I thought my old favorite Vegetable Couscous would be perfect with quinoa instead of the couscous. The only problem was, the recipe as written just wouldn’t be enough food for a hungry potluck crowd. If you’re a vegan and you ever attend large, non-vegan potlucks, you know that you need to bring a lot of food or risk not having anything to eat. If you’re not right at the front of the buffet line, you may find that once you reach your dish, all that’s left are a few grains of quinoa and a couple pieces of bell pepper. And if yours was the only vegan dish on the table, you may wind up dining on a few grapes and olives, if you’re lucky. To be certain my family and I wouldn’t have to rely to grapes and olives, I needed to double the recipe, and I had enough of everything except zucchini. So I rummaged around in my fridge and found the vegetables that would go best in the recipe–cauliflower and eggplant–and added them to the mix. I also updated the seasoning a little by using fire-roasted tomatoes and smoked paprika along with a hint of cardamom. I thought the results were fantastic, and best of all, it made a huge platter of food–which was empty by the end of the meal. Fortunately, our church potlucks have become very vegan-friendly lately, so there were plenty of delicious vegan options this time–vegan gumbo, channa masala, chickpeas and rice, even vegan chocolate chip cookies–as well as grapes! But it never hurts to come prepared with a heaping dish of plant-based food. This dish is smoky and infused with cumin, with a touch of sweetness from the raisins, but it’s very mild in terms of heat, so I served it with a side dish of sambal oelek, a very hot chile paste, for anyone who wanted to spice it up. If you’re a spice lover, feel free to increase the cayenne pepper in the recipe or do as I did and add liberal amounts of chili sauce, harissa, or sriracha to your own plate. This recipe feeds a crowd! For a smaller family, click here for the 4-serving version of the recipe or click on the serving number to scale it to as many servings as you need. Heat a large non-stick skillet over medium-high heat. Add the onion and sauté 2 minutes. Sprinkle in the garlic, cumin, turmeric, paprika, cardamom, and cayenne and cook 2 minutes more, stirring often. 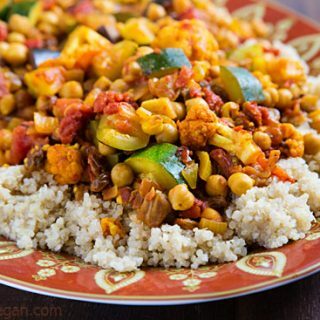 Stir in the cauliflower, eggplant, chick-peas, tomatoes, raisins, and 1/2 cup of water. Cover the pan and lower the heat to medium. Cook, stirring occasionally, for 10 minutes. Add the zucchini and continue to cook covered until it is just beginning to be tender, about 10 minutes. Add salt to taste. While the vegetables are cooking, prepare the quinoa. Heat a large saucepan and add the rinsed and drained quinoa. Toast it, stirring constantly, until it is almost dry. Add the vegetable broth or water and bouillon and the garlic, bring to a boil, and stir in the salt if you’re using it. Turn heat to very low, cover, and cook for 15-20 minutes, until all liquid is absorbed. Remove from heat until needed. Fluff with a fork before serving. Serve with the vegetable mixture mounded in the center of the quinoa and a jar of harissa or hot chile sauce for individual seasoning. Not a fan of eggplant. Do you suggest a worthy substitute? I would just increase the amounts of the other vegetables to make up for the missing eggplant. You could try adding some different ones, if you want. Mushrooms maybe? any suggested substitutions for the eggplant and zucchini (both make me gag)? I figure on potatoes for the eggplant, but what about the zucchini? It’s a texture thing so I’m afraid none of the summer squashes will do. I’m thinking green beans……………. Yes, green beans and any other vegetable you like should work fine.